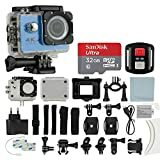 Supports up to 64GB micro SD Card (Maximum) – Single Shot and Snapper – Burst Feature 3 photos per second – Super lightweight & small in size – Recording Formats: 4K/2K/1080P/720P/WVGA – Waterproof Casing allows filming 30 meters underwater. Detachable Battery – Records while charging – HDMI Output – Web Camera – HD Screen for Videos and Image Playback – Available in 7 Colors. The Sports Cam (Blue) is a high-definition motion video recording device, created to reach market. It has a wide variety of the leading features for digital video recording, photo shooting, audio recording with screen display and detachable battery. Waterproof up to 98ft/ 30M. Best suitable for vehicle recording, outdoor sports, Home security, diving and more related activities. Allowing you to enjoy the moments while capturing every scene anytime, anywhere.